Magic is a fascinating hobby! It is fascinating because it uses dazzling displays and mysterious illusions to captivate audiences of all ages. Because magic is so fascinating, many people want to learn how to be a magician. However, becoming a magician is a big responsibility—one that requires practice, dedication, and respect. By reading this article, you already have shown an interest in learning magic. Today, I am going to expose you to the underground world of magic, and by the end of this article, you will be well on your way to becoming a great magician. If you learn some magic tricks and follow those guidelines, you are welcome to call yourself a magician. The next step in becoming a magician is to understand more about the hobby. Every magic trick you learn can be categorized into an "effect" and a "method." The effect of a magic trick is a description of what the trick looks like to the audience. Part of the effect includes possible "patter" for the trick. Patter is what you say, as a magician, during the trick to keep your audience interested. Sometimes a trick will have little to no patter"that can be a good thing under certain circumstances. The method of a magic trick is an explanation of how to do that magic trick. Magic tricks are often composed of "sleights," or special moves/illusions that accomplish a desired effect without the audience's knowledge. Some sleights are used quite a bit in magic, and other sleights are used infrequently. Sleights are helpful because they make it easier to explain how to do a particular trick. 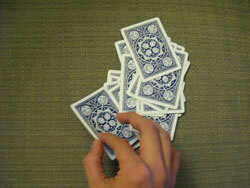 Most of your time as a magician will initially be spent learning and practicing sleights. Some sleights can take years to master, while others can be learned in a single day. Many sleights accomplish similar things. Some other terms you might hear are "spectator" and "heckler." A spectator is anyone who is watching your trick. A heckler is a spectator who is a nuisance. Hecklers often try to mess up a magician, expose a magician's secrets, or lessen the amazement of the audience. Having the necessary equipment is easy. If you wish to do card magic, buy a deck of cards. If you wish to do coin magic, find some large coins. Many magicians who are just learning magic tend to rely on special "gaffs" or props to accomplish their illusions. Using gaffs, which you can buy from any magic store or online, is a great way to start learning magic. 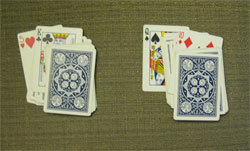 However, as you become more experienced, I encourage you to at least try out classic sleight of hand. As you learn, try to start with easy tricks and easy sleights. Some of the best tricks in magic are easy to perform, so do not think that you will be unable to perform great magic as a beginner. Great magic is the result of confidence, practice, good patter, and good style. Once you have learned a few tricks, you will want to develop a routine. A good routine consists of about five to fifteen magic tricks. Some situations might dictate fewer tricks, and other situations might dictate more. If you have a good routine of five to fifteen tricks, you should be able to adapt to most situations. When developing a routine, it is good to have smooth transitions between tricks. For example, if you start with a card trick that reveals the four aces, a good next trick would be a trick that involves the four aces. The order of the magic tricks in your routine is also important. You want to start with one of your better tricks to catch the audience's attention. However, you also want to finish strong, so save another one of your better tricks for the end. Part of developing your routine is to plan the patter for your routine and to develop a style for yourself as a magician. What you say during a trick greatly correlates to your style as a magician. Everyone can perform the sleights involved to create magic. However, good magic is the result of good patter and good style. A great magician can amaze audiences with a bad trick. A bad magician struggles to amaze audiences with any trick. Some magicians try to have a comical style, making jokes with the audience as they go. They might pretend that even they have no idea how the trick worked. That kind of style might suit you. Other magicians try to be mysterious, rarely talking, but instead, focusing intensely on what they are doing. They might feign exertion during their tricks for maximum impact. Finding a style that is right for you may take time. The best way to develop your style is to watch professional magicians perform and then to go out and try different things yourself. In terms of patter, you have unlimited options. Some magic tricks even come with patter that you can use. What you say during a trick is up to you. Just make sure that what you say makes sense. If a spectator cannot follow you during a trick because your patter is confusing, the trick will not work. Finally, the last part of becoming a magician is practice. Practice is extremely important, but you have to be sure that you are practicing well. If you do not already have a mirror, buy a mirror that you can perform in front of to see what your trick might look like to the audience. It is important that every sleight you perform is nearly flawless. You do not want the audience to see anything out of place. You are trying to create the illusion of real magic, remember? It is important to try to do everything as naturally as you can. If you get nervous in front of people, practice can help build your confidence. You want to be sure to practice not only the sleights you plan to use but also the words you plan to say as well as the flow of your routine. You want to make sure that you know which trick comes next at any given time. Recording your routines with a video camera is also helpful because it shows you what your performance looks like to the audience, and it helps you learn to be a better public speaker. Video cameras also allow you to record your performance from different angles. Some magic tricks are angle-sensitive, so practicing for different angles is important. If possible, it is also helpful to practice in front of magician friends. If you do not have any friends that are magicians, you can try posting videos of your progress on forums online. Many magicians out there can give you helpful tips. Worth noting, however, is that some aspects of magic are hard to practice. Misdirection, for example, is hard to practice without an actual audience (misdirection is the act of calling attention to something else while you do something devious). Learning how to recover from mistakes in the middle of a trick is also something that requires practice, but is difficult to learn without experience. Learning how to adapt your routine to handle hecklers is similarly difficult. Understand that you will make mistakes. The more you practice ahead of time, the less likely you are to make a mistake. As you become more experienced, you will learn how to handle difficult situations a lot better. So try a little bit of everything, decide what you like, and get practicing! You are well on your way to becoming an amazing magician. Now go have fun!